Lezyne have created precision high pressure pumps offering the new air bleed system (ABS). When using Presta valves, pressing the ABS button releases air back pressure which then allows for the easy removal of the valve. 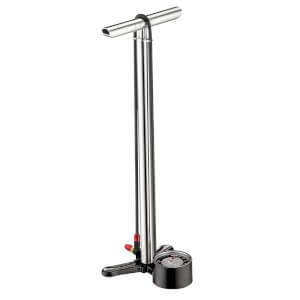 The ultimate lightweight travel floor pump with all the capabilities of a full-size model at half the size. All parts are made of custom CNC machined aluminium resulting in an extremely precise and durable design. Equipped with the Air Bleed System Flip Thread Chuck threads directly into Presta or Schrader valves for 100% secure air-tight connection. 1.5” gauge is compact and precise. Max pressure: 160psi / 11 bar. Size: 508mm x 190mm x 60mm. High Quality precision pump. Easy to use. Fits together well for its purpose - as a result tube is shorter than a full floor pump but still easy to use. Top Product.